Was The Best Exotic Marigold Hotel too mainstream and too safe for your tastes? Don’t worry; there’s a fine alternative that pushes a few more boundaries and even explores new and uncharted areas when it comes to the subject of holidaying septuagenarians. Youth, writer-director Paolo Sorrentino’s follow-up to his Oscar-winning The Great Beauty, and only his second English-language film after This Must Be The Place with Sean Penn, is an entertaining and exceptionally beautiful film that lacks the kind of pretentiousness a few arthouse films of this type tend to become trapped in; it is a quiet tale of aging with grace, looking back on desires of the past, and either accepting it or refusing to give in to it, but it has a refreshing sense of humour in its quirky nature and satirical approach to the media of the present day. The story, too, is very simple; two lifelong friends, composer Fred (Michael Caine) and film director Mick (Harvey Keitel), are staying in a luxurious Swiss hotel along with a few other celebrities like an obese version of Argentinian footballer Diego Maradona (Roly Serrano), a beauty pageant winner (Mădălina Diana Ghenea) and young actor Jimmy (Paul Dano) who is eager to move away from the role everyone associates him with, a robot in a popular science-fiction film. During their stay, Mick works on a new screenplay with a group of young writers, while Fred is approached by the Queen’s Emissary (Alex Macqueen), who attempts to persuade the retired composer to perform one of his famous “Simple Songs” for Prince Phillip’s birthday, which Fred continuously declines for “personal reasons”. On top of everything, Fred’s adult daughter Lena (Rachel Weisz) yearns for her father’s love more than ever after her marriage breaks down, causing both Fred and Mick to look at their twilight years with a new pair of eyes between them. Contrary to that extended description, the plot itself is very light, but appropriately so; the intent of Sorrentino with this film, we so gather, is to have the audience feel as relaxed as the hotel guests are in several spa scenes, not worrying too much about the troublesome mechanics of the real world and the weight of the events happening around us, and instead focusing on having a pleasant time. A lot of this film feels like going on a lovely holiday, with Sorrentino and regular cinematographer Luca Bigazzi painting an absolutely amazing landscape of the Swiss countryside, from the mountains in the background to the green fields in the foreground, and a heavily stylised set of scenes watching the hotel guests go about their day, whether they’re huddled together like sardines in a swimming pool or watching varied forms of entertainment in the evenings (it opens, for instance, with a live karaoke performance of Florence and the Machine’s “You Got The Love”). The way everything is filmed, framed and presented, it’s likely that Youth will do to the Swiss countryside what The Best Exotic Marigold Hotel did for India, and make it a must-see tourist destination, which is never a bad thing so long as that doesn’t get abused. Thematically, the film is really about age and how people both young and old view their different but somewhat similar lives, whether it be with resentment, joy, cynicism, optimism, and so on. Fred and Mick are both still in their prime, even if Fred can’t come to that conclusion about himself (despite his reluctance to perform for Her Majesty, he still harbours a musical imagination, “conducting” symphonies of cow bells and plastic wrappers), but are seen by select others as being way past it, in a subtle jab at the current state of ageism in the arts; Jimmy, meanwhile, still believes that he has an opportunity to prove himself as an actor rather than let himself be typecast, and is determined to do whatever it takes with the latest role he’s preparing for to achieve that – the reveal of who he’s meant to be playing, by the way, is one of the most darkly-humorous shocks we’ve seen in a while. However, what sets them apart is that Fred and Mick, having gone through long and prosperous careers together whereas Jimmy is only really at the start of his, are able to look on their old-age problems and have fun with it, comparing how many trips to the bathroom they’ve had in a day, or taking bets with each other over whether a silent middle-aged couple also staying in the hotel will actually say anything. Caine and Keitel haven’t been this good in ages, proving the ageist naysayers wrong with two powerful performances that tug at the heartstrings without being manipulative, and prove to still be enjoyable and likable actors even at this stage in the game. Dano, too, is effective and has a good amount of character to work with (a scene between him and a younger fan is genuinely charming), while Weisz gets more to do here than the majority of her roles over the last few years. Watch out, too, for a brief but scene-stealing turn by Jane Fonda, as an aging actress who shows up to tell Mick some life-altering news. Culminating with a grand and marvellous performance of one of Fred’s “Simple Songs”, which is incidentally up for an Academy Award, it will help you leave Youth not necessarily feeling uplifted, but with a new sense of wonder and beauty regarding age that not even The Best Exotic Marigold Hotel could accomplish. 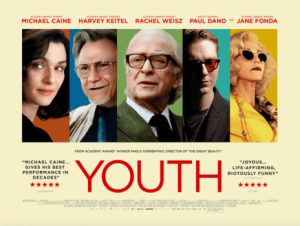 Youth is a lovely gem by writer-director Paolo Sorrentino that tackles age and its complications through an entertaining, and sometimes very funny, direction that refreshingly lacks pretence and places emphasis on the beautiful cinematography as well as the central performances by Michael Caine, Harvey Keitel and the rest of its talented ensemble cast.